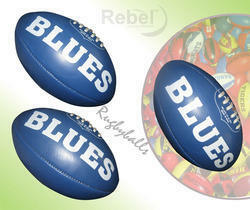 We are one of the foremost manufacturers, suppliers and exporters of a comprehensive assortment of Australia Rules Football. the complete range is specifically manufactured using best grade raw material and advanced techniques as per industry standards. 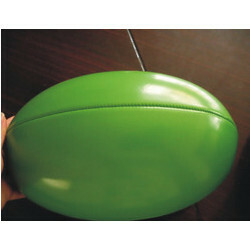 Available Material Genuine Leather,Rubber Synthetic,FoamingPVC . Hand satiched fitted with latex bladder. 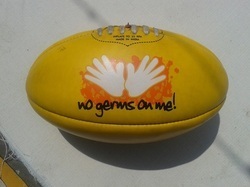 Fully customized & all sizes all available. 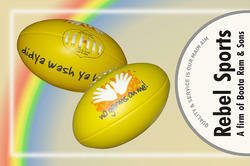 Available in Rubber Synthetic, Artificial Leather, Genuine Leather Material.Hand Steached, Available in 2Ply ,3Ply,4Ply. 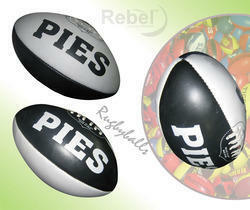 Available in Match Quality, Trainning Quality And Promotional Quality.Fitted with latex bladder. All size and color are available. Designing and customized facility are available. 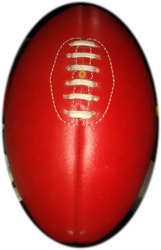 Australian Rules Footballs are available in different materials like Rubber synthetic and Genuine Leather and Artificle leather. 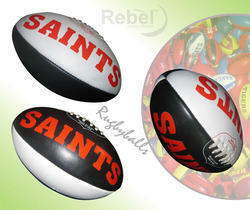 Available in all Sizes from 6" to size 5 . we manufacture balls with different customer logos and specifications. 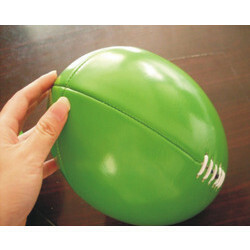 Best Quality cloth lining is used so as to achieve accurate flight and shape retention.we manufacture these balls from promotional level to Match quality balls level. 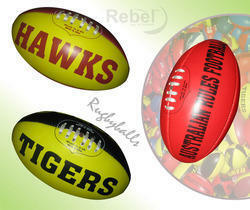 Australian Rules Footballs are available in different materials like Rubber synthetic and Genuine Leather and Artificle leather.Available in all Sizes from 6" to size 5 . we manufacture balls with different customer logos and specifications. 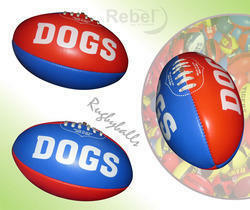 Best Quality cloth lining is used so as to achieve accurate flight and shape retention.we manufacture these balls from promotional level to Match quality balls level. 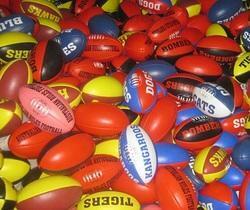 This Australian Rules Football made off High Quality Genuine Leather,hand Stiched and fitted with Latex Bladder. 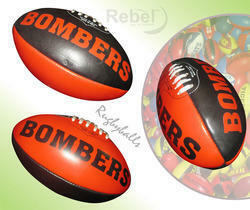 We offer an incomparable assortment of Australia Rule Leather Football, which iswidely appreciated and demanded by the sports professionals across the nation. 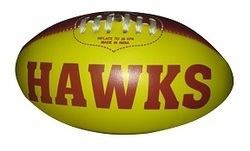 These footballs are precisely manufactured using optimum grade raw material and advanced techniques. Further, to meet the diverse requirements of sports professionals, we also offer the range in customized specifications based on the details provided by the clients. Acknowledged and preferred by beginners and professionals alike, our quality-approved range of Australia Rule Football have helped us to garner a rich clientele in markets across the globe. To keep the trust of the clients, we ensure that the complete range is specifically manufactured making use of high grade leather and other allied material. Further, following industry standards, we check the range on various parameters to ensure delivery of only flawless products. 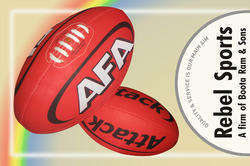 Looking for Australia Rules Football ?